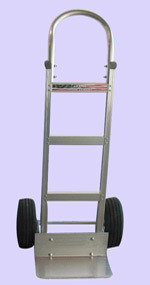 Riverside Paper is now offering the only Made in America Adam’s Aluminum Hand Trucks. 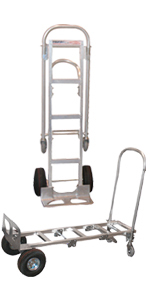 These heavy-duty hand trucks are available in a variety of models. Below are the Continuous Handle and Loop Handle models. Choose from several different configurations of wheels and nose plates. 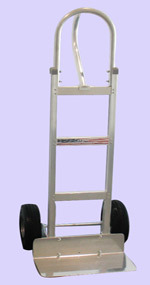 Aluminum Hand Trucks are available with a Cast Noseplate or a Solid Extruded Nose Plate. Wheel choices include; Solid Rubber Wheels, Pneumatic Wheels and our new Fat Free wheels. Check back often, as we will be adding more. Buy these American Made hand trucks, you'll be glad you did.